We set out on our Langtang Trek at 7:30 AM on April 25, 2015. After another registration check, we headed off onto the trail. 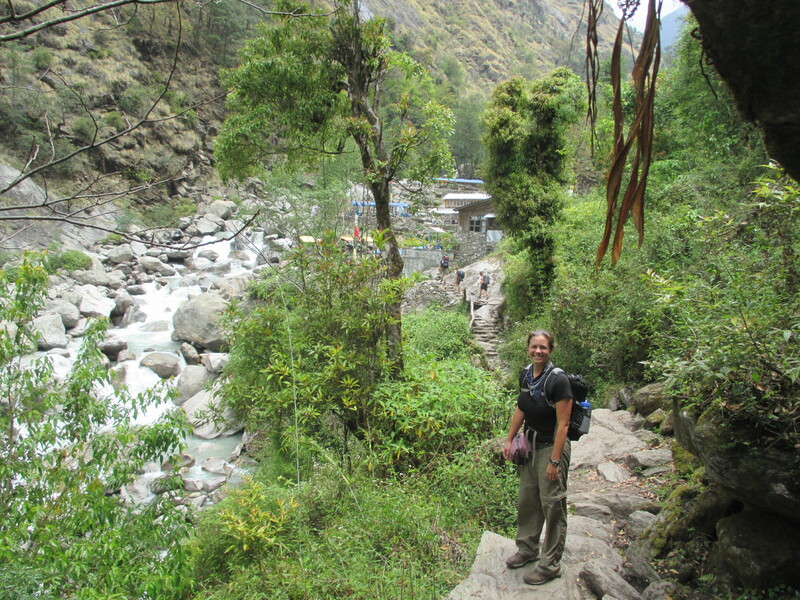 We took the large bridge over the Trisuli River, walked through Old Syabrubesi, and then followed the trail upstream along the Langtang River. There are two ways to start your Langtang trek: the “high way” and the “low way.” The “high way” provides better views, but requires more climbing. Our guidebook suggested that the “low way” would be a more gentle introduction, so as novice trekkers we decided to choose that. Even the “gentle” route involved mostly climbing up, as the river is descending rapidly through the entire valley. 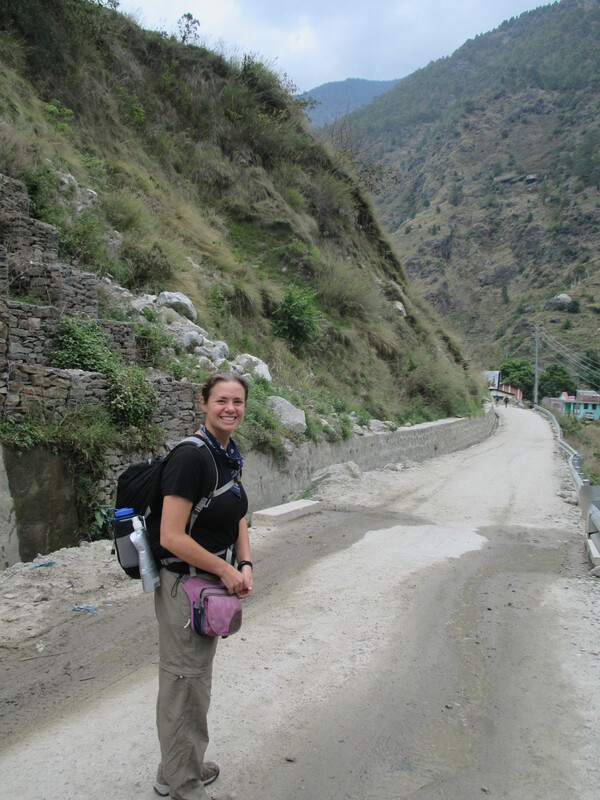 We enjoyed the wide variety of plant life – it was quite green, as we had not yet reached the elevation of the snow-capped peaks that you think of when you hear about the Himalayas. The terrain actually looked quite a bit like the mountains back home in Colorado. As we walked, we encountered a few different groups of hikers heading up the trail, some of whom we had seen on the bus the previous day. Our pace was a bit slower than the others, so we would end up being passed by them. But, we tended not to take the longer breaks at villages along the way, so we would pass them there and then get passed 15 minutes later again. It became somewhat of a running joke with a group of three Israelis and their guide (who had been on our bus the previous day as well). An hour into the trek, we crossed another large suspension bridge over the Langtang River to the south bank, then continued trekking up. There was one more small suspension bridge over a side stream near the small village of Domen. At the village of Pairo (also known as Landslide), the Israeli’s guide had clued us into a hot springs on the north bank, which we walked over and checked out but didn’t get in. After Pairo, it was a semi-steep climb to the next village of Bamboo. It was almost lunchtime, but we weren’t feeling too hungry. Rimche was not too much further along the trail, so we considered pushing through to our final destination. But, as we approached Bamboo we saw many of our trail-mates had stopped for lunch, and there was a waiter ready to promote his outdoor terrace as the best right at the first place, so we decided that a small rest wouldn’t hurt us. 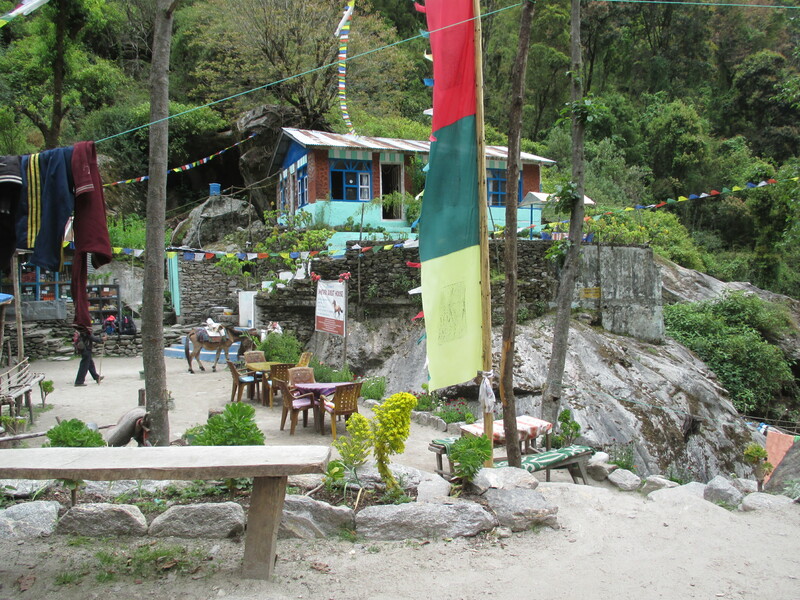 We sat down at the outdoor eating area on the terrace of the first teahouse and ordered a cup of tea each and some chapati. The tea came out pretty fast so we took our first few sips as we rested our feet. The seating area was in a nice location in the center of the valley, right out over the river. The time was 11:55 AM.